Another pearly gray day today but with the addition of a stiff North wind blowing rain sideways on the beach. 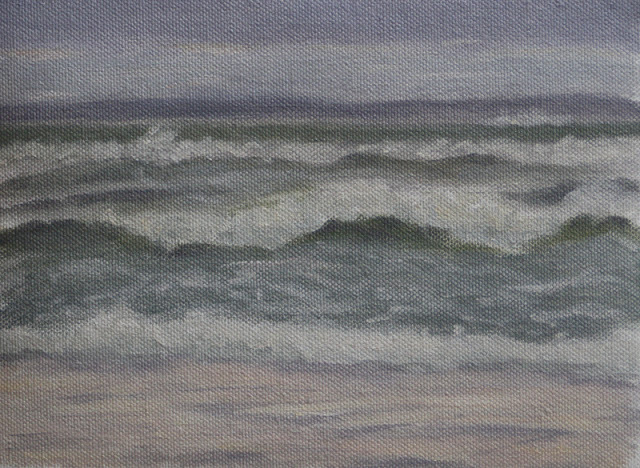 Not good painting conditions at all but I did spend time just studying the waves. That is always a joy. If you look at Wave Study #39 posted yesterday you will see some similarities and slightly different skies. The sky changes by the minute. Since water reflects the sky, I start a seascape painting with the sky. That also gives me a reference to judge the proper values of the water too. ©2013 R.L. Delight, Wave Study Bulletin Board. The first one is on the top left and the fortieth one on the bottom right. There is a painting out of order and that is the one on the bottom left. It was painted plein air on a panel instead of the canvas of the others. The first two were also painted on panels that had been toned with burnt sienna. The first fifteen canvases were on the hemp fabric that I gessoed which were quite rough. The rest are on the pre-primed canvas sheets I got from Utrecht in pads. I really enjoy looking at the paintings in my studio this way. 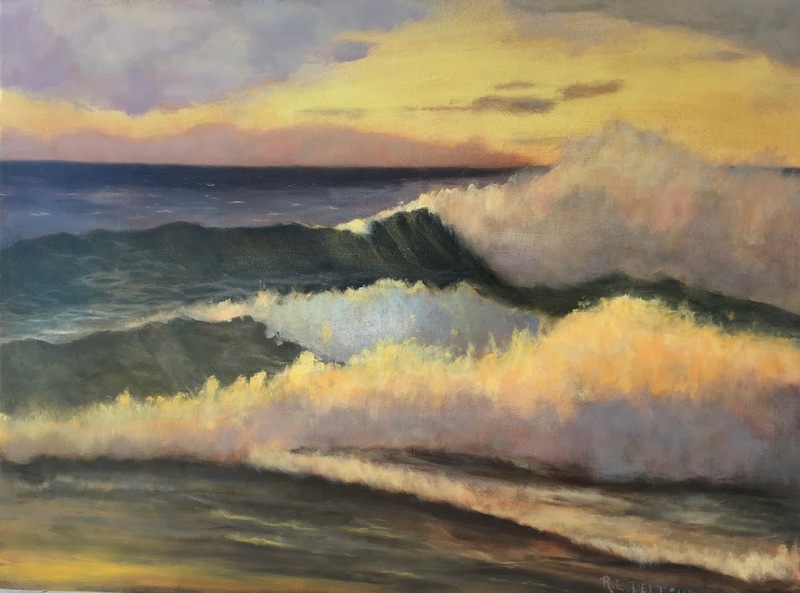 Sometimes it can get discouraging learning to paint the sea from life but when I stop and look, I am satisfied that I am making progress. I will need to take these down to start the next batch. 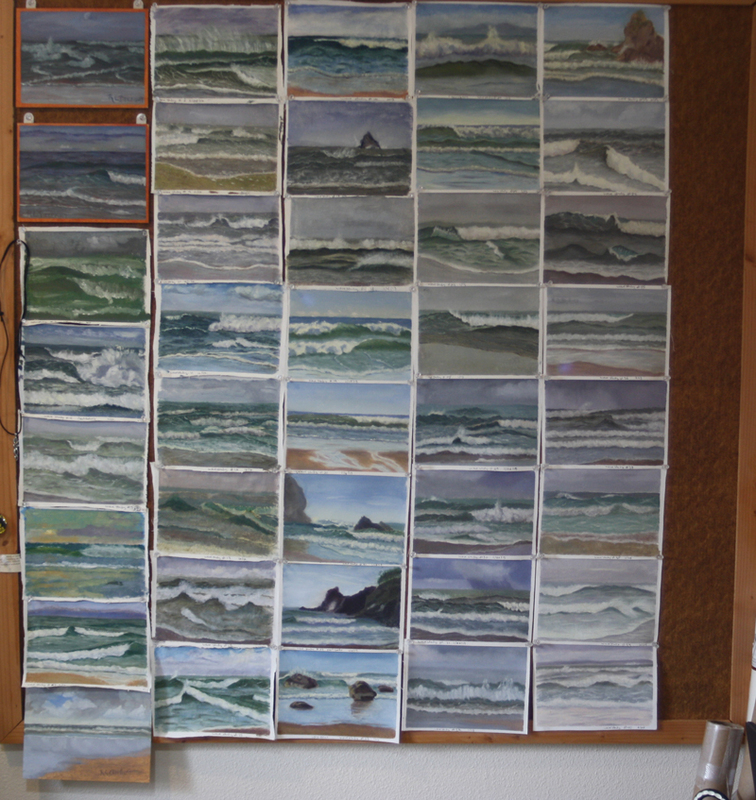 I need to find a good way to store these little studies so that I can easily access them for reference. 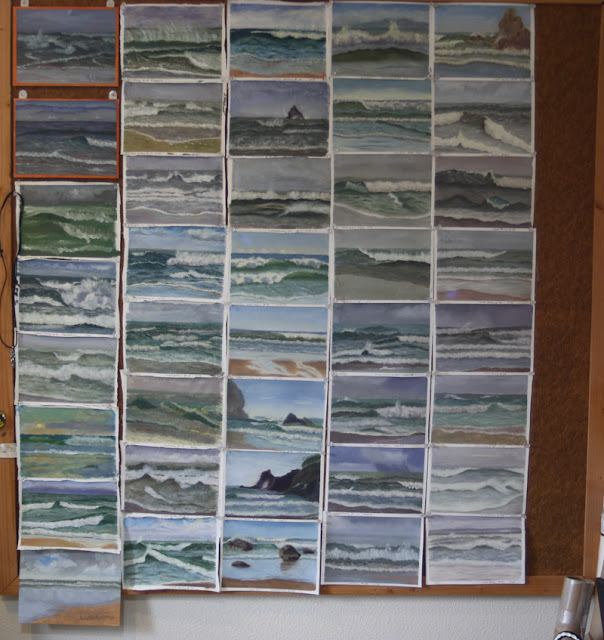 I am so enjoying painting these studies that I am considering turning them into a painted journal of a year on the coast, which would mean I would need to continue well beyond 100 studies even with not painting a painting a day. I will have to think about it. This weekend (Sunday, Monday) is time for friends and community. I will have a few new things to share on my next post on Tuesday. What an AMAZING collection of studies you have already. I love seeing them all together. The progress, the mood from day to day. Some standouts too among them. Can you put them in a binder of sorts? Do they make clear protectors safe for this sort of thing. Or maybe you should just put a high tension wire up around the room close to the ceiling and start clipping them around! ;) Follow the wave studies. Anyway, lovely. Enjoy your days of rest, reconnecting and recharging. Hi Theresa, I like your idea of the high wire. I was thinking of mounting the paintings on archival board and making them into some sort of book or folio for reference. As I plan to have a hundred or more, I would probably run out of room for the wire! One of the reasons I am thinking of continuing for a year is that it is fun to see all the light and weather changes. Summer would be a challenge as the waves calm down. Perhaps would need to go further down the coast. Hmmmmm. This collection of studies is just amazing. I love seeing them together. Keep on waving!